Stocks fell sharply in October but that doesn’t mean they won’t rally in November. That’s the challenge investors now face. If there’s a bear market, it can be best to avoid the stock market. But, there are always rallies within a bear market. Missing them can hurt returns. Plus, there is always the possibility of a trend reversal. Stocks could rally sharply. That means investors should consider keeping some stocks in their portfolio at all times. But, which ones are buys? One approach is to buy value stocks. Another approach is to focus on the short term and buy stocks with strong seasonals. We will look at following one of the simplest seasonal trades possible. Few traders follow seasonal strategies although these strategies are often profitable. They are also relatively low risk because they limit market exposure to short periods of time. To apply this strategy, every month, an investor would run a scan to find the stocks with the best historical performance for that month. That’s it. There aren’t any other criteria. There is no doubt that there is a seasonal trend in the market with some months delivering gains more often than others. That can be seen in the chart below which calculates the percent of time the month is higher for the Dow Jones Industrial Average since 1900. With more than 117 years of data, there are some significant swings in winning percentage from month to month. For some reason, June and September are bearish months. December is the most bullish month of the year, a cause for hope in the current market environment. We found a simple way to benefit from monthly tendencies in stocks. We ran this strategy on TradingTips.com in real time for all of 2017 and beat the market. With a tough market environment, it could be time to revive the strategy. To find trades for November, we will start by looking at how stocks have performed, on average, during the month. We assumed the stock was bought at the beginning of the month and sold at the end of the month every year. We then calculated how well that strategy would have done for every stock in the Russell 3000 index. We limited our test to stocks in the Russell 3000 because those are the most liquid stocks in the market and their liquidity might provide an options trading strategy. 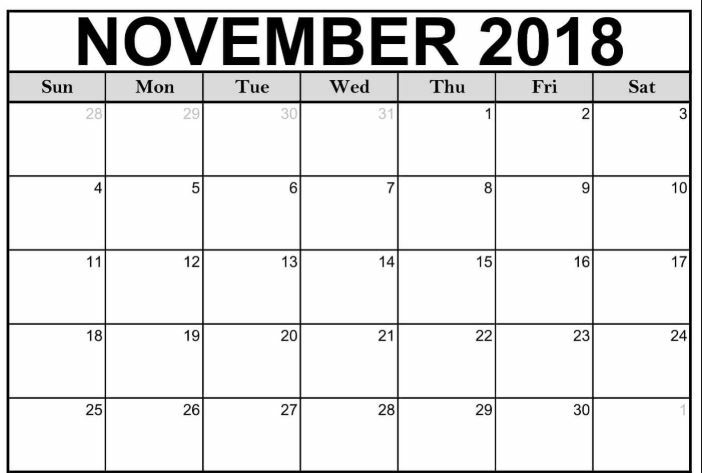 Of course, it’s important to remember that instead of buying the stocks, a trader could buy a call option that expires at the end of November or later. Because these are the most liquid stocks in the market, many of them have weekly options available. That allows you to match the expiration date closely to the strategy. Call options allow for exposure to a stock with less cash since call options often trade for less than 5% of the cost of the stock. There are risks to trading options and you should familiarize yourself with those risks before placing any options trades. This month, six stocks made the list of potential buys. We don’t need to know why these stocks perform better than average in November, we are simply trying to benefit from their tendency to do so. It is important to remember that each of these stocks is highlighted based solely on the seasonal trend. We have not considered the fundamentals or technical picture of any of these companies. That fact provides an opportunity for you to refine the trading strategy. 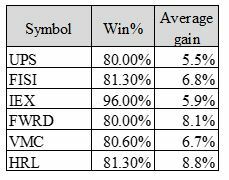 Now, it is important to remember we never know whether a trade will be a winner or loser and we never know which stocks we highlight each month will deliver the biggest gains, or which ones will be losers. That will always be true with system trading and is an example of why system traders must always take all of the system signals. The key to a successful trading strategy is to follow it with discipline. You could consider the strategy to be the entire list of stocks that pass the screen each month or you could refine it. As we’ve noted in the past, perhaps you only want to trade two stocks on the list. Among the many possible ways to refine the list would be to determine the price-to-sales (P/S) ratio for each stock and sort from lowest to highest so the deepest value lies at the top of the list. Then, you would buy those two. This is just one example of how that process could be implemented. The same general idea for selecting stocks could be applied to dividend yields, earnings growth rates or even technical factors such as relative strength (RS). With RS you would most likely want to own the strongest stocks. As an alternative, you could look at RSI, the relative strength index, and buy the stocks with the lowest value. These would be the most oversold stocks and the ones that would be expected to rebound over the next month. We are simply following all of the stocks on the list without using any other filters. Obviously, the strategy could be expanded to buy three or more stocks. Buying just one stock on the list each month is probably not the best approach since there is no way to know which stocks will provide gains each month. The results of our high probability trading screen for November are shown in the table below. Any of these stocks, or call options on these stocks if available, could be considered as a trading possibility for the month of November. It’s important to remember that in identifying these trades, we applied one of the least sophisticated seasonal strategies. We simply identified stocks that performed well in a calendar month. Even though it’s simple, it is a powerful trading strategy.